Baddie – Disney movies are capable of being scary. Lesson – A movie can really stick with you through the years. Remember last week? I promised my brain cells I’d watch a children’s movie. What I didn’t tell them was that it was a very scary children’s movie (for a child). 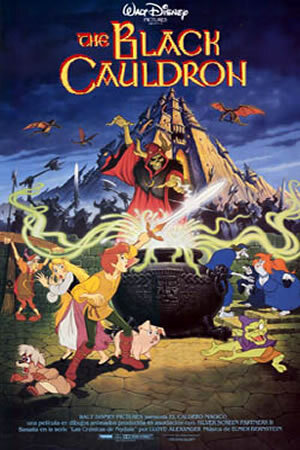 The Black Cauldron is a movie about a hobbit boy who takes his magical ring pig to the castle of Sauron The Horned King and desperately attempts to destroy the item of power – the Black Cauldron. 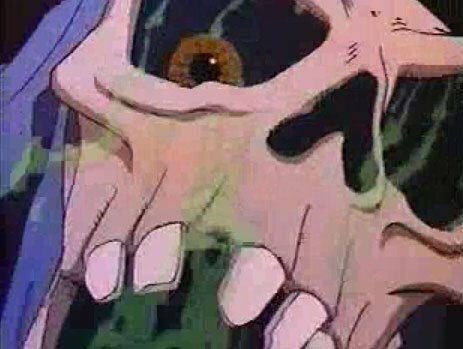 I remember watching this as a child, and I remember it being scary. I also watched the animated The Hobbit (Rankin Bass) and also being scared, predominately of Gollum and the large spiders. 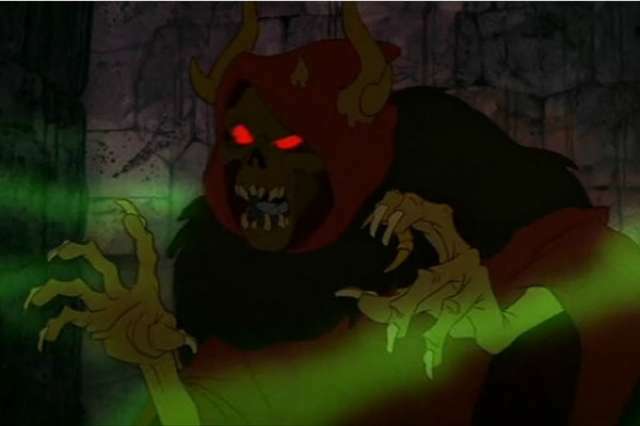 The Black Cauldron is scary for a few other reasons, namely, the implications. The deal with the actual cauldron is that if one throws a corpse into it, it oozes evil and resurrects corpses to fight for the owner of the cauldron. Obviously, this is bad. Obviously, the Horned King (basically a skeleton, but creepier somehow) makes it his goal to obtain said cauldron and rule the world. It’s kind of a great thing, because basically if a soldier dies in battle fighting the undead soldiers, they just come back. This is an army that will literally just become the entire world if allowed. But wait, there’s more. Let’s chat about the actual plot of this sucker, shall we? Taran is an assistant pig keeper. We know this because he gripes about it the entire movie. Henwen is a magic pig. She can have visions. It’s trippy. Obviously, the pig can be used to find the Black Cauldron, so Taran is instructed to bring her to a secret cabin. Taran messes this up. Epically. Actually, this movie is somewhat of a comedy of errors for Taran. Whoops, lost the pig. Hey, the Horned King’s castle! Better save the pig. Better make a lot of racket and get captured (although he did save the pig, so, I guess that’s a plus). This is where he meets Princess Eilonwy. She’s full of sass. And she saves his whiney little self. So, blah blah adventure ensues, magic sword, fairies, witches, etc. The important part is that Taran naively finds and exposes the black cauldron thinking he can destroy it, but basically gift wraps it for the Horned King. The Horned King wastes no time and raises his army. That’s right. The heroes in this movie lose. Well, okay, no, but. They lose for about 10 minutes, and then the world is shakily, clumsily, awkwardly righted. Actually, for a Disney movie, this thing toys with your emotions pretty hard. ***SPOILER*** There’s a subcharacter, Gurgi, who is a fuzzy companion critter thing, and basically Gurgi has a moment where he realizes that he’s ‘useless’ and ‘friendless’ and hurls himself into the cauldron. It’s actually really sad. And then when they finagle to win him ‘back’, they keep Gurgi dead for way too long. Like, long enough that you wonder if they actually just gave back the corpse. That’s messed up, Disney. ALSO THERE’S BLOOD in this movie. Like actual blood. A couple of times. Taran gets a bloody lip, the cauldron bleeds, and there’s blood on the stump when they threaten to behead Henwen. Seriously, straight up nightmare fuel. 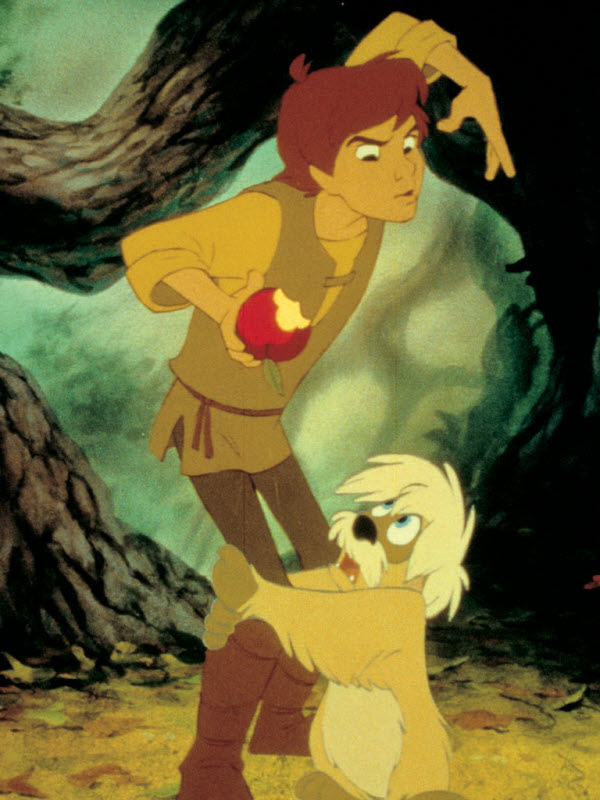 All in all, if you’re looking for a quirky little Disney movie, I would suggest The Black Cauldron. It’s got the same charms as Sword in the Stone but is a little kitchier. It has some heart, and it’s fairly serious for a Disney film. Hey! This is my 50th post on Rooster Illusion. Even I’m surprised at my dedication. June 21, 2013 in Movie Review, SciFriday.